The Mercury Cased Caddis imitates Brachycentrus caddis larvae. The Mercury Cased Caddis imitates Brachycentrus caddis larvae, which are easily identified by their brown, rectangular, tapered cases. The Brachycentrus caddis makes up the famed Mother’s Day Caddis hatch that occurs mid-May. The Mercury Bead entices selective trout by imitating the gas-like bubble during the emerging process. For quicker sink rates, we swap out the dubbed black head for a tungsten bead. The Mercury Cased Caddis fishes best at dawn or dusk as the highest numbers of caddis larvae are drifting throughout the system. This is in large part due to behavioral drift, a phenomenon that suggests that there are times when aquatics insects are unusually active and move about the substrate. 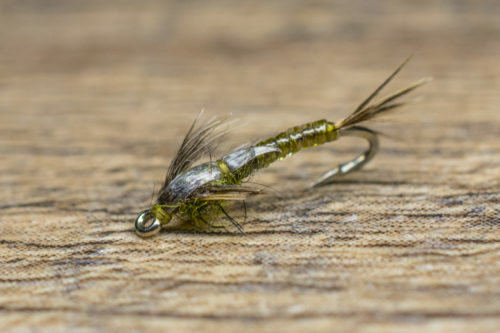 The Mercury Caddis is a great attractor in a tandem nymphing rig. Trail a dropper that matches the hatches found streamside.